Have you ever dreamed of living within a Publix? When it’s dinner time, you walk around the store and collect the ingredients to make your favorite dish. For breakfast oatmeal, you head to the aisle and choose the type, then head over to the raisins for a little sweetener in your oatmeal. Making pancakes? The baking aisle has everything available and you can choose to add a little whole grain, too. I have read a lot of articles recently about the advantages of buying in bulk. Saving money, having food pantry items available when needed, and eating real foods are among the reasons given. But then some cite the problems with purchasing from bulk bins in stores. Often people are reaching into the bins, many people throughout the day, leaving a bacteria path. Cooking grains might destroy most or all of these, but what about the items we choose to consume raw? Another problem is the possible allergen contamination. If you have a family member with milk allergies and the oats in the bulk bin have been in contact with a dry milk powder, serious health issues are raised. There is a very easy solution to this concern, of course. 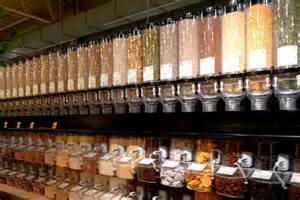 Instead of purchasing from the bulk bins, purchase in bulk. Pass by the one pound box of oats and buy 25 pounds. 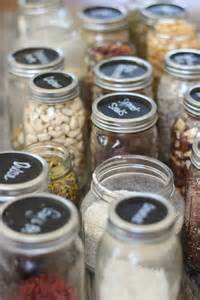 Half gallon mason jars are perfect for storing many dry goods and seal tightly against bugs and dust. They are also easy to clean and reuse. Items that don’t last as long at room temperature can be sealed in containers and kept in the freezer. Yes, you might need a slightly larger freezer, but a good chest freezer is very economical to operate and is good for bulk items. Restaurant sized tubs and containers can be set on the bottom of the freezer and eliminate many individual packages. Of course there is always the cost factor. 25 pounds of oats is cheaper than buying 25 – one pound boxes, but what if your budget does not allow that first big purchase? One solution that works well is to budget for one item each week, or perhaps two a month. That way, you are rotating your bulk purchases and leveling out your budget. Buy any item in bulk that you can save a considerable amount on and that you will use regularly. After all, what good is saving 50% by buying 25 pounds of wheat flour if you only use a pound of wheat flour a month? But if you bake or use flour in other items and are regularly buying two 10 pound bags a week, you might want to consider pricing a 50 pound bag. Another solution is to save a little aside each week, from your food budget or even from entertainment. Plan what you will purchase and how much you need to save to do so. This works well for those who will be traveling to a warehouse to make the purchase, or if you can save even more with a larger overall purchase. Again, plan to purchase in bulk in amounts that you will use in a reasonable amount of time. What time frame is reasonable? That will depend on the product and your storage. We have a large family, so old food usually doesn’t happen. But small or large households need to plan a little. Try to analyze the amount you are using of your most common items first. For our family, that includes such dry items as brown rice, oats, nutritional yeast, whole grain flour, and a variety of nuts and seeds. I have a rough idea of the amount of each of these that I use during a month’s time. That amount varies, of course, but a rough count is all that’s needed. Some of these dry goods are planned for a 4 month cycle in our home; we purchase them about 3 times a year; others are used more frequently and are purchased every other month. A few items are actually purchased a couple of times a year. Most of the dry goods, with proper storage, are easy to keep for 6 months and some, kept sealed and in the freezer or proper dry storage, can last for a year. Bulk buying offers several benefits. The most obvious is the potential savings on your food budget. I expect at least a 25% overall savings, although we actually save more than that. 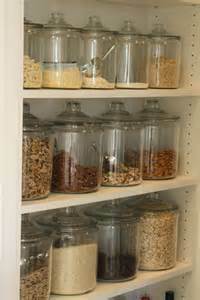 The initial investment of jars and storage containers is quickly offset by the first savings. Other cost factors include fewer grocery store trips and less food waste, as you are only using what you need each time from your bulk storage and the extras are not spoiling; you are prepared to store them. Another benefit that is less considered but equally important is that of time and convenience. You are building your own grocery store at home and replenishing less often. Less shopping time is important to me, but so is the fact that when something arises that I need a little extra food for, I have it on hand. If the kids want to make a loaf of bread for the neighbor, everything is on hand. Potluck time arises, we have that covered. Convenience without resorting to processed foods. Bulk buying and storage also helps with emergency preparations. If a major storm is coming or we have a power outage, we always have enough food on hand to keep the family fed. Our menu might change, but the pantry has plenty from which to choose. It’s also a blessing during those times when cash is a little short due to some other money crunch, such as major car repairs. Be aware, however, that it won’t replenish itself; after the emergency, you will need to restock.